Nvidia has already revealed the desktop flagships of the Maxwell lineup, but it looks like it still has one more card up its figurative sleeve, atleast as far as Mobility Geforce is concerned. A report originating from NotebookReview forums (via NotebookCheck) reveals that Nvidiai is working on a brand new flagship chip codenamed “N16E-GXX”. The video driver website LaptopVideo2Go has also spotted a suspicious entry named “Nvidia E-GXX” in latest Geforce drivers, so this upcoming mobility graphic card is pretty much confirmed. The only question remains as to its exact specifications – which we will take a jab at below. 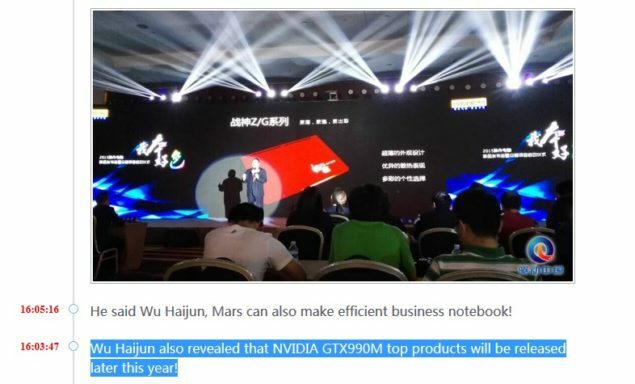 The news stems from Wu Haijun, CEO of a Chinese laptop manufacturer, who revealed that Nvidia is planning to reveal a Geforce GTX 990M mobility graphic card sometime in the September to December time-frame ( or Q4 2015 in other words). The chip’s performance, according to the executive, is supposedly as high as the current GTX 980M SLI configuration. The current GTX 980M chips are based on a crippled GM204 die with 1536 CUDA cores (4 out of the 16 SMMs disabled). The Geforce GTX 980M SLI configuration currently outpaces the desktop Geforce GTX 980 by several tens of percent. The CEO further revealed that the TDP of the chip is going to be upwards of 100 Watts (and could be as high as 180 Watts). Now I don’t need to point out how that high a TDP level seems very unlikely for a mobile setting; something that already has over-taxed cooling solutions and plummeting battery levels. Interestingly however, the report also states that the GPU in question will be soldered onto the motherboard – which helps lend a bit of credibility to the report since the MXM platform has a TDP limit of 100 Watts. This would also mean we would not be seeing any MXM based variants and the GTX 990M graphic card will only be present in select luggables and laptops that have been designed from the ground up to support it. While the timeframe given is the fourth quarter of 2015, we could expect the chip to land as early as September (considering it has already started popping up in driver updates). Finally, please keep in mind that the nomenclature “990M” is just an educated guess, the real thing could easily be called something else entirely, like GTX 985M or 995M for example. Lets come onto the specification estimation now. This portion is mostly educated speculation (based entirely on the assumption that the claim about it being equal to a GTX 980M SLI and ~180 Watts TDP is correct), so if this isn’t your cup of tea, this would be a good place to stop reading. The GTX 980M performs roughly 30% faster than a stock desktop Geforce GTX 980. The desktop GTX 980 has a CUDA core count of 2048 and a max TDP of 165 Watts. The GTX Titan-X on the other hand has a CUDA core count of 3072 and a max TDP of 250 Watts. For the supposed Geforce GTX 990M to perform 30% faster than a stock 980, we are looking at an approximate CUDA core count of 2662.4 cores (at the same clocks). Which, rounding off to a known SMM configuration means we are looking at an SMM count of either 20 or 21 (where the GM200 has an SMM count of 24) with either 2560 or 2688 CUDA cores respectively. So we are either looking at a low clocked, cut-GM200 die with around ~20 SMMs or we are looking at a fullblown GM204 die with very high clocks. Both variants lie in the same power-performance envelope as the one stated by the CEO and both play well with yield theory. The notebooks that house the ‘N16E-GXX’ GPU or the Geforce Mobility “GTX 990M” graphic card will have to have some pretty impressive cooling solutions and robust power supply to power this beast. The soldered-to-motherboard design should help ensure a constant stream of juice and should make designing native cooling solutions relatively easily. A chip like this will easily smoke most single card desktop setups and should help Nvidia deliver on their promise of desktop class gaming in laptops.